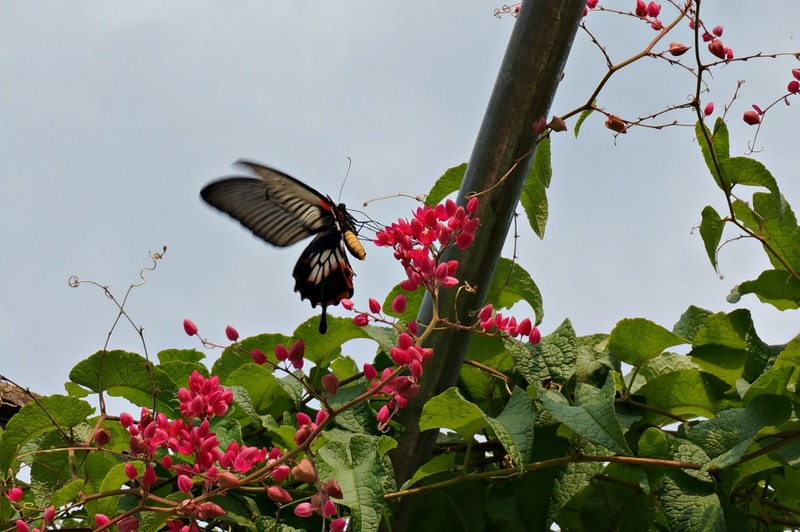 This was the Vietnam I had dreamed about seeing – only just a little bit better. Mai Chau Valley is in the Northern providence of Vietnam, about a three-hour van ride from where we were staying in Hanoi. Most of the people who traveled with us in the van were doing a day trip to the area, cycling around the rice paddies and shopping for locally produced handicrafts. 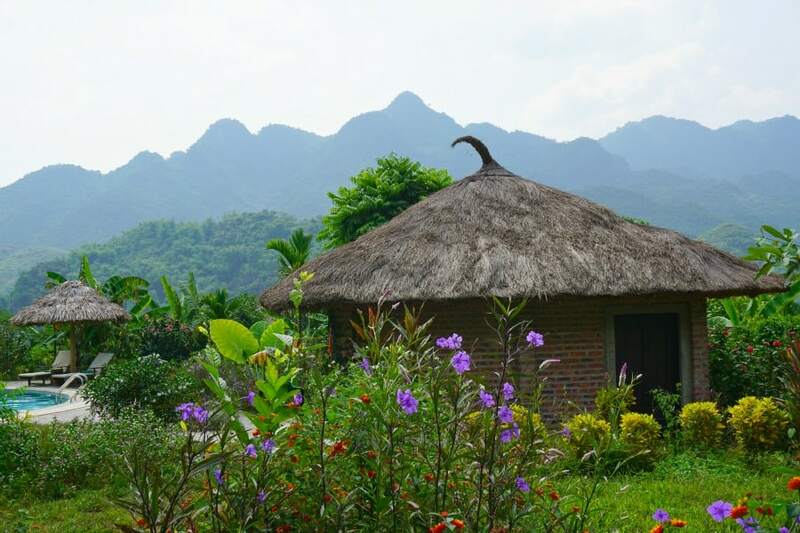 We opted instead to stay overnight at the Mai Chau Ecolodge and get a well deserved break from the chaos of Hanoi. (You can get an idea of what I mean by checking out the Hanoi Vietnam Street Eats tour we did while we were there). 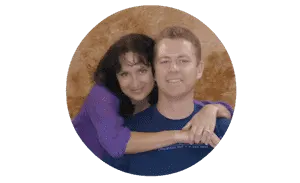 We discovered our mistake even as we were just approaching the property – we were only going to be staying for one night. Clearly, that was not going to be enough. 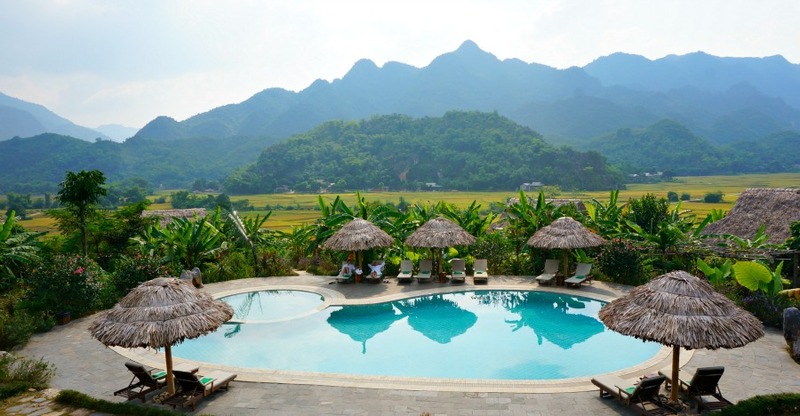 Our first glimpse of the Mai Chau Ecolodge overlooking the rice paddies. This concern was confirmed as we got a better look around. 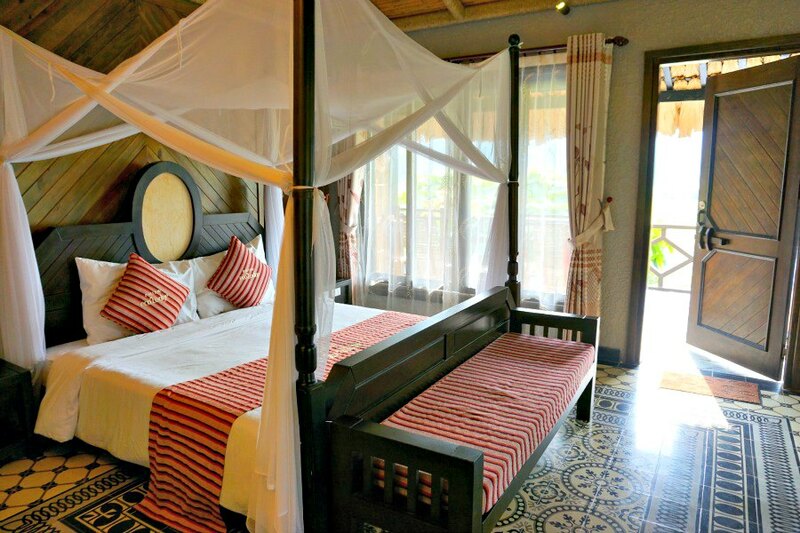 The lodge prides itself on using locally sourced, sustainable products in constructing the property. 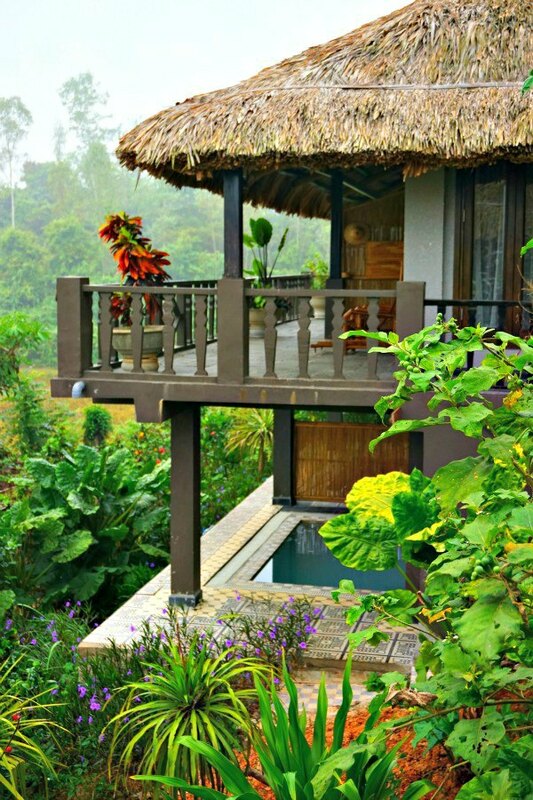 Everything is landscaped using native plants and the lodge itself practically melts into its surroundings. 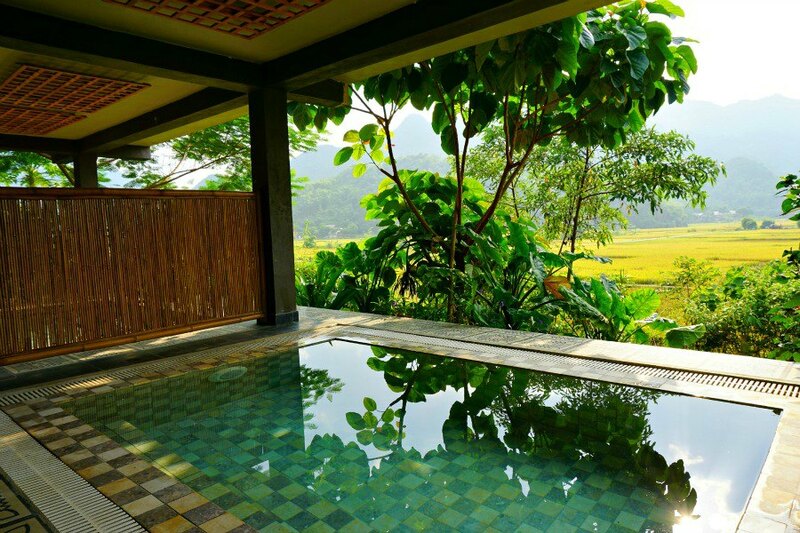 There are no TVs in the rooms at this property – the idea is enjoy the natural surroundings and unplug. And we proceeded to do just that. (Although, the lodge does provide wifi access, so in truth, we weren’t completely unplugged). We were already feeling relaxed as we made our way to our room, where we were in for a few surprises. The best part of this little mini vacation, however, was yet to come. 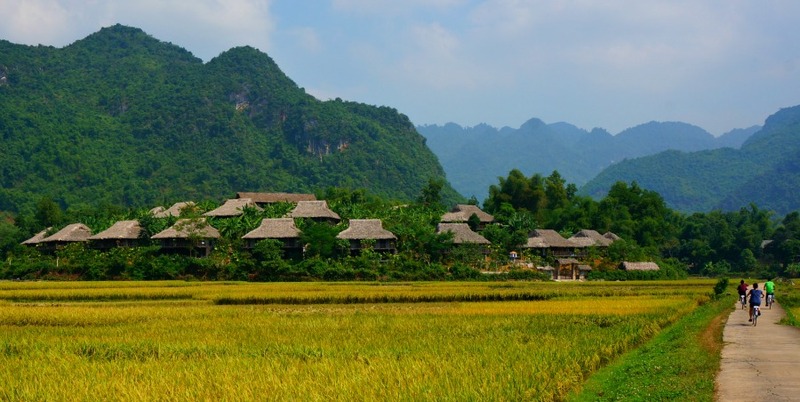 The next day, after we had enjoyed some Vietnamese cuisine in Mai Chau’s Restaurant and watched a local dance demonstration in the lodge, we were able to spend some time exploring local daily life in the village. The lodge actually provides bikes so that you can ride to do a self (or guided) tour of the villages. Here the locals actually waved to us as we rode past them and their happily grazing water buffalo in the fields. And we saw lots of locally produced handicrafts (such as intricately hand-woven scarves and purses). Our added treat was being invited to spend the afternoon with a farmer and his wife and cook lunch together in their home. Wow, what an incredible place. I will be sure to put this on my bucket list! 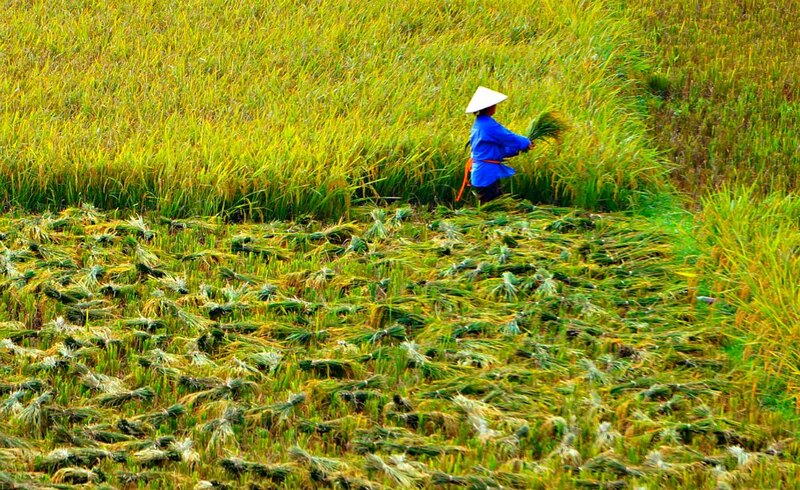 Vietnam is one of my favourite countries and we are hoping to return next year. Will keep this lodge in mind. While reading the post and looking at the photos I actually felt relaxed. 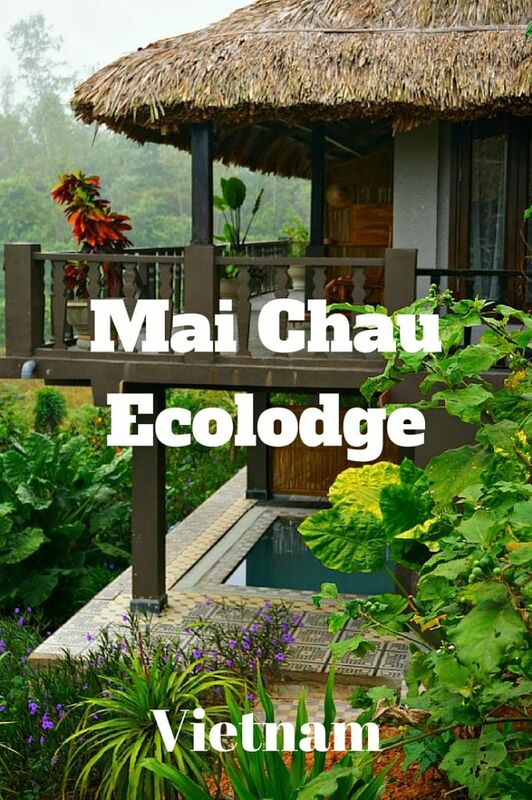 The Mai Chau Ecolodge looks like a great place to get some R&R. Oh! The food in the photo looks delicious as well. Wow! I’ve never been to Vietnam but this post gives me enough reason to plan a vacation to Vietnam. Thanks a lot for sharing! Such a fabulous recommendation! We will be in Vietnam next year and I’m definitely looking into booking here. I love that you are unplugged, but still have access to wifi 😉 We work while on the road so that is a necessity for us. Excited to experience this place first hand! Looks like a really lovely place! Thank you for sharing your photos. 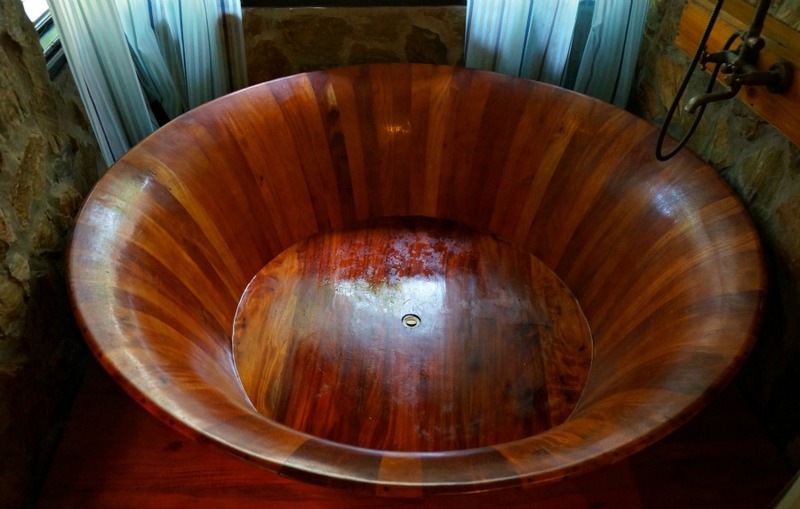 I must say I really love the bathtub though I wonder how ecological it is, unless the tree was cut down by someone else. 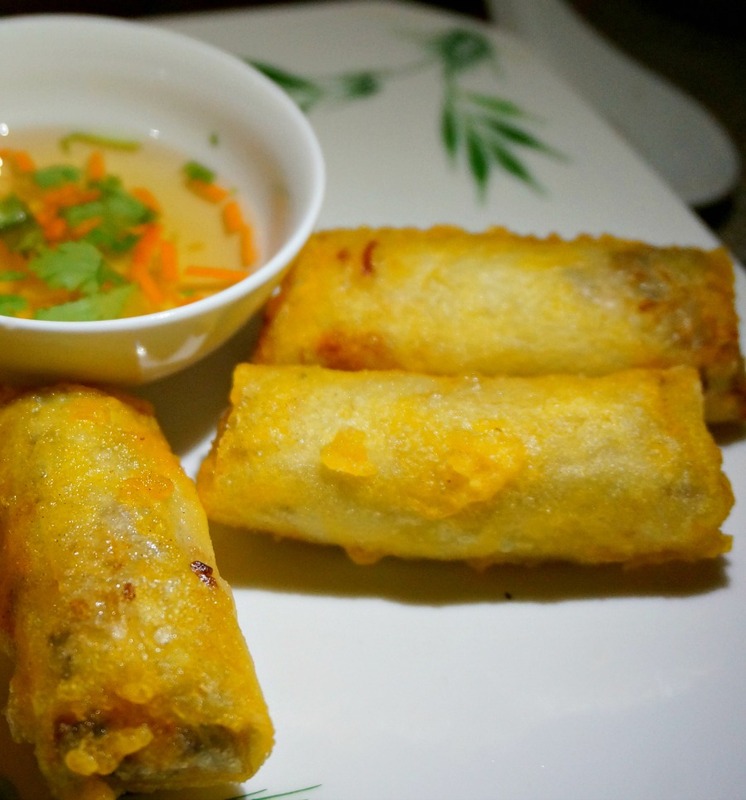 The spring rolls look yummy too! The first photo of the resort pool literally made me want to jump on a plane right now! I love the fact that they force you to unplug – really makes you appreciate the experience much more than when your mind is wandering back and forth from device to another device! And the amount of nature you can obviously explore and enjoy from the site you probably don’t have time for tech anyway! Those landscapes and views are sublime. 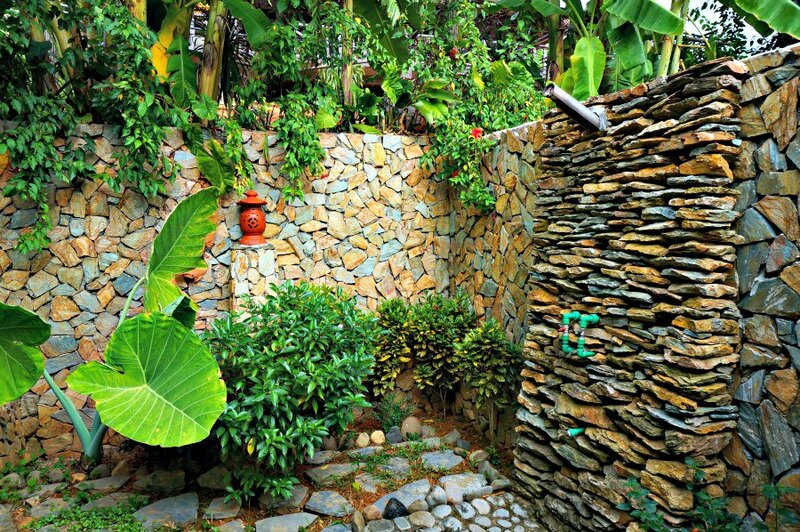 Looks like a perfect spot to meditate, journal and just let it all soak it. wow such beautiful photos , seems like such a lovely place to stay!